3. Operation Mincemeat was a successful deception campaign planned for the allied invasion of Sicily in World War 2. It involved the British deliberately dumping a corpse on a beach in Spain with fake documents stating that the Allies were going to land an invasion force in Greece and Sardinia instead of Sicily. This saved the lives of thousands of allied soldiers and allowed for an easier take-down of Mussolini. 4. Vietnam War POW Doug Hegdahl pretended to be illiterate to fool his captors, who believed him to be so stupid that they gave him almost free rein of the camp. He was able to secretly memorize the details of about 256 POWs to the tune of “Old MacDonald,” which he still remembers. 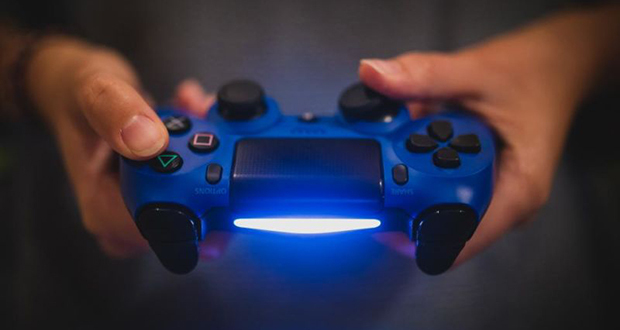 The infamous antigaming website, MAVAV (Mothers Against Videogame Addiction and Violence) was a hoax created to show how information can be propagated on the internet. 7. In 1982, a 15-year-old named Rich Skrenta tried creating a digital prank on a floppy disk that had a video game. He ended up creating the first computer virus. The virus would stay in the computer and infect any new floppy disks that were inserted. 8. The cannons used in Human cannonball shows are not really cannons but catapults. Fireworks and gunpowder is used to trick people in believing they are actually cannons. 9. As part of the famous travelling gnome prank, people have stolen these lawn ornaments and then sent its owners picture of the gnome in front of famous landmarks, as a practical joke, before returning it. 10. In older Scandinavian society, a popular Christmas prank was to place a straw goat in a neighbor’s house without them noticing. The family successfully pranked had to get rid of it in the same way. 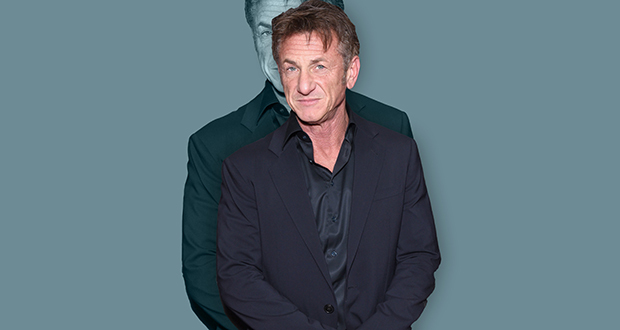 In 1998, Sean Penn was taken hostage in a police department holding cell and dragged outside at gunpoint, only to learn that the whole thing was an elaborate prank orchestrated by Woody Harrelson. 12. Stephen Hawking's son named Tim Hawking once added swear words to his dad's voice synthesizer as a prank. 13. Actor John Cleese once defaced his school's grounds "as a prank, by painting footprints to suggest that the statue of Field Marshal Earl Haig had got down from his plinth and gone to the toilet." 14. Liam Neeson once prank-called Maggie Grace's (played his daughter in Taken) Ex-Boyfriend as his character in Taken. 15. President Lyndon Johnson would play pranks on unsuspecting guests by driving his amphibious convertible into lakes screaming about the brakes being out. 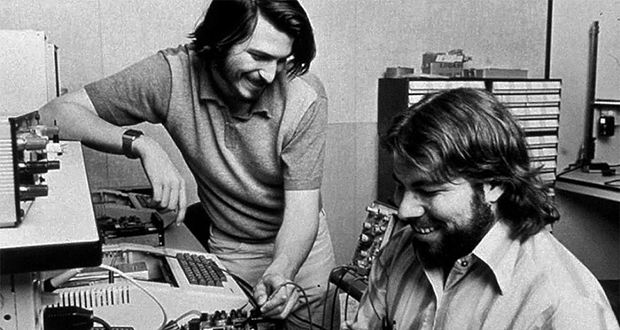 Back in the 1970s, Steve Jobs and Steve Wozniak prank-called the Pope pretending to be Henry Kissinger. 17. On New Year's Eve in 1999, Brad Pitt rented a Mexican resort, filled it with his friends and at midnight had the government cut the power and phone lines and send in troops to raid the compound and “arrest” one of his best friends on drug charges, all as a practical joke! 18. 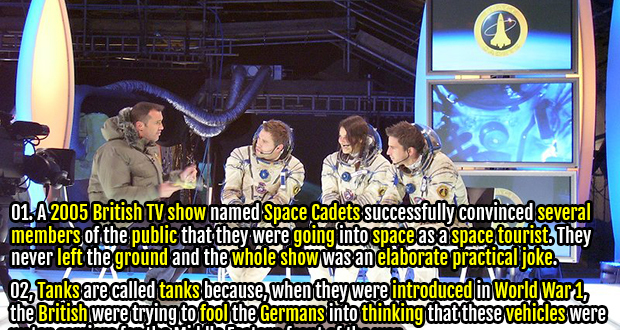 A 2005 British TV show named Space Cadets successfully convinced several members of the public that they were going into space as a space tourist. They never left the ground and the whole show was an elaborate practical joke. 19. In 1996 as a hoax, Taco Bell printed in six major American newspapers that it had bought The Liberty Bell and was renaming it The Taco Liberty Bell. 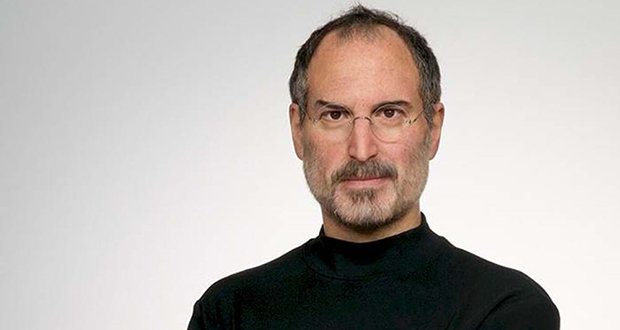 In 2008, during the CNN's experiment in citizen journalism, a 4chan user made a fake news report stating that Steve Jobs “died of a heart attack.” After the prank went viral on social media, Apple’s stock dropped by about $5 billion. 22. The Macrocilix maia moth confuses predators with design patterns on its wings that mimic two flies eating bird sh*t. It even releases a pungent odor to drive home the deception. 23. Towards the end of World War 1 a 'second Paris' was built to fool German bombers into not bombing the real Paris. It was complete with a Champs-Elysées Avenue and Gare Du Nord rail terminal, wooden replicas of buildings, and white, yellow, and red lights to create the effect of machines working at night. 24. An American burglar named Mike Kurtz found out that eating common soap could produce the effect of ill health. His sudden and unexplainable weight loss and other symptoms baffled the prison doctors and he was able to fool officials into believing that he was dying and received a pardon. 25. Tanks are called tanks because, when they were introduced in World War 1, the British were trying to fool the Germans into thinking that these vehicles were water carriers for the Middle Eastern front of the war.